A satellite went through something totally unprecedented in the history of our space adventures. The European Space Agency (ESA) has revealed that a tiny particle travelling at a whopping speed of more than 40,000 kilometres per hour (24,850 mph) has collided with a satellite in Earth’s orbit last week. ESA scientists estimated that the object measured only a few millimetres in width, but the shock did create an impact area on the satellite’s solar array;measuring 40 centimetres (15.7 inches) across. The incident was detected when the ESA scientists encountered a sudden small power reduction in the solar array of Copernicus Sentinel–1A. This satellite has been used since 2014 as a radar imaging satellite for the purpose of monitoring environmental changes from orbit, e.g. the shrinking of Himalayas after the Nepal earthquake. After the collision, the Sentinel–1A’s orientation and orbit were also changed, which confirmed the crash between the satellite’s solar array wings and the space object. Scientists are still determining what the particle was, but most recent estimates term it as a piece of space junk weighing less than one gram. The engineers finally activated the onboard cameras on the satellite to confirm the collision hypothesis, and the pictures taken and observed did testify to the earlier projections. “The pictures of the affected area show a diameter of roughly 40 cm created on the solar array structure, confirming an impact from the back side, as suggested by the satellite’s attitude rate readings.” says Krag. Sentinel–1A was both lucky and unlucky for being in the way of this super speed space junk. It was lucky as the damage was not irreparable, especially considering that there are over 500,000 pieces of larger space junk in the orbit; which would have certainly caused greater damage. But it was unlucky too as the chances of a satellite being hit in its lifetime are somewhere between one in 30 and one in 130. 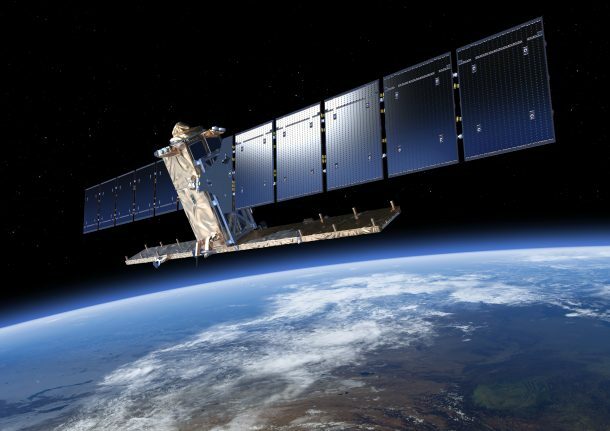 The ESA says the impact will have no effect on the satellite’s routine operations, and the dip in the power generation will be compensated by the surplus of electricity it has onboard. But it puts our attention towards the need to manage the space debris, and to keep a lid on the waste and junk we leave in the space during our extraterrestrial adventures.